The Electoral College, administered by the National Archives and Records Administration (NARA), is not a place, it is a process that began as part of the original design of the U.S. Constitution. The Electoral College was established by the founding fathers as a compromise between election of the president by Congress and election by popular vote. The people of the United States vote for the electors who then vote for the President. Read more about how the terms “Elector” and “Electoral College” came into usage. How Many Votes do States Get? Each State is allocated a number of electors equal to the number of its U.S. Senators (always 2) plus the number of its U.S. Representatives. The number of electors for a State is based on the number of members in the House of Representatives who represent the State, plus two for the State’s Senators. A State’s Congressional delegation is determined by the State’s population. The number of people in each State is determined by the Federal census, which is taken every ten years and includes a count of every State’s population. The process for selecting electors varies throughout the United States. Generally, the political parties nominate electors at their State party conventions or by a vote of the party’s central committee in each State. Electors are often selected to recognize their service and dedication to their political party. They may be State-elected officials, party leaders, or persons who have a personal or political affiliation with the Presidential candidate. Then the voters in each State choose the electors on the day of the general election. The electors’ names may or may not appear on the ballot below the name of the candidates running for President, depending on the procedure in each State. How did the terms “Elector” and “Electoral College” come into usage? How does the Electoral College elect the president? Can citizens in U.S. Territories vote for President? 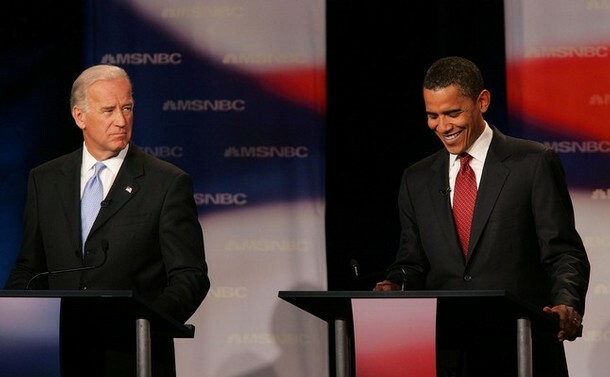 Is my vote for President and Vice President meaningful in the Electoral College system? What Federal laws govern the Electoral College system? Were any measures introduced in Congress to change the Electoral College process by amending the Constitution? How do the 538 electoral votes get divided among the States? There are 538 members of the Electoral College. How could that number change without amending the Constitution? What is the difference between Colorado’s proposal to proportionally allocate electoral votes and the current way that Nebraska and Maine proportionally allocate electoral votes? Where do I find the names of the 2004 Presidential electors? How can I check the county by county results of the Presidential election in Ohio? The process for selecting electors varies throughout the United States. Generally, the political parties nominate electors at their State party conventions or by a vote of the party’s central committee in each State. Electors are often selected to recognize their service and dedication to their political party. They may be State elected officials, party leaders, or persons who have a personal or political affiliation with the Presidential candidate. Then the voters in each State choose the electors on the day of the general election. The electors’ names may or may not appear on the ballot below the name of the candidates running for President, depending on the procedure in each State. The election will take place on November 4th 2008. 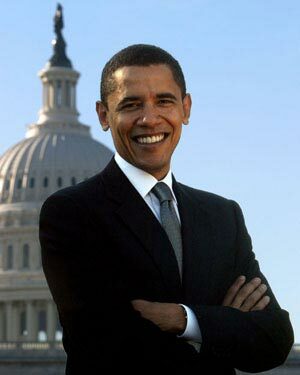 Barrack Obama is the Democractic candidate. Democratic is the party or group of people who support him and want him to win the election. 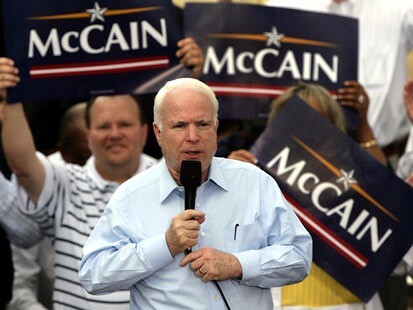 John McCain is the Republican candidate. John McCain is part of the republican party. Republican refers to the the party or group of people that support him for president. 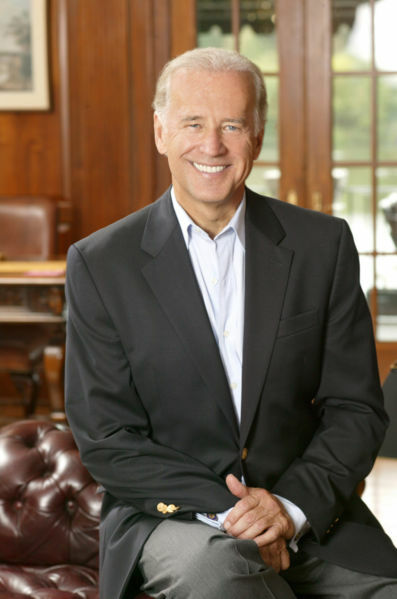 Senator Joe Biden as his vice-president. 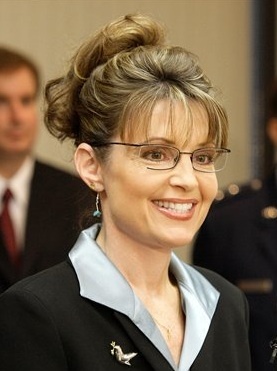 Governor Sarah Palin as his vice-president. Answer the following questions in full sentences: You can Re-watch the Brainpop movie if you like. 1. What is the title of the leader of our nation? 1. How do presidents get their power to lead? 2. What document created our present form of government in the United States? 3. What is the Presidents Job? Name at least 4 things he does. 4. What does veto Mean? 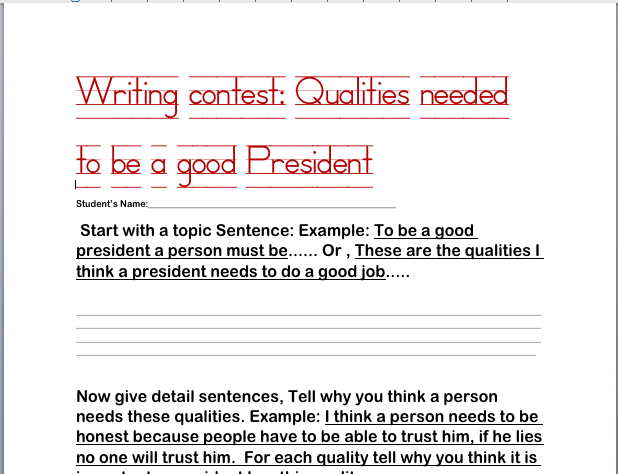 5 What exactly is the presidential policy? 6. What exactly is the president’s cabinet? 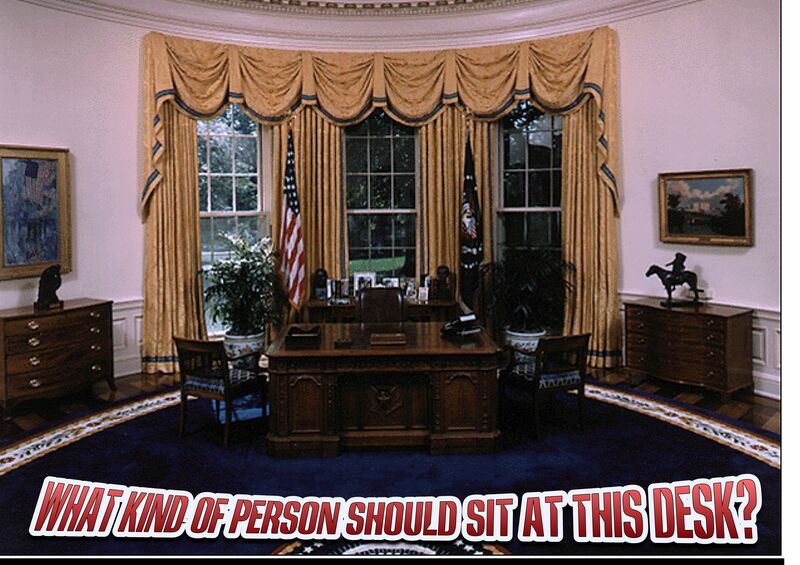 7 . Who can become president? We are not yet finished posting our podcasts on the Election. Here is another from James in Mac’s class . 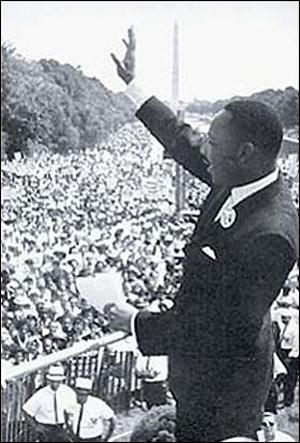 Now for the announcement of the memorial on the Washington Mall for Dr. Martin Luther King Jr. Here is the link to read the TFK article lets read it and leave a comment on their site. Then I want to begin an on-going discussion about civil rights in the month of December. I want to start it but I very much want you, my students to take it and make it your own. We will need to look at just what Civil rights mean in our world in the U.S. and maybe other places. If what I am saying seems vague in a way it is. I don’t want to tell you what I think, but have you do the research and decide what civil rights mean to you. Just read the story, leave a comment, and begin to think about MLK and just why he deserves the same honor as Washington and Lincoln.